I want to congratulate the PSCP office bearers on the launch of this first newsletter “The Spectrum”. The selection of this name is quite interesting as Chemical Pathology traditionally deals with the visible and invisible spectrum of light. It also indicates the wide variety of disorders dealt by a Chemical Pathologist in its clinical practice. In addition, in day to day working, a Chemical Pathologist is usually approached by various specialists like Physicians, Surgeons, Gynaecologists and Paediatricians regarding interpretation and further investigations of their patients. The Chemical Pathology Laboratory usually has lion-share of work load in any Clinical Laboratory and a properly trained Chemical Pathologist is vital for imparting service to the ailing humanity. PSCP is a professional body that plays a pivotal role in the advancement of the specialty by organizing various activities like conferences, courses, workshops and seminars. Newsletters and other publications like this provide an opportunity to the professionals to express themselves on their favourite topics in a relatively informal manner. It can also act as an archiving document for recording various activities and for acknowledging the efforts of the members of any professional body. 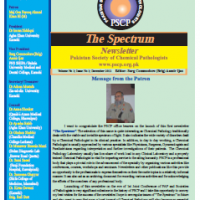 Launching of this newsletter on the eve of 1st Joint Conference of PAP and Societies of Pathologists is very significant milestone in the history of PSCP and I take this opportunity to convey my best wishes for the success of the newsletter.I hope to see regular issues of “The Spectrum” in future and also want to pray that soon a local journal of Chemical Pathology will also become an essential publication of PSCP.